This is a basic method for rolling up sushi. 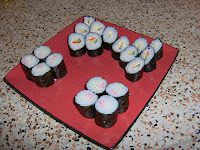 Hoso-maki or Slender roll is one of the easier rolls to start with. Once you master this, try some larger or more complicated rolls. 1. Place bamboo mat on a board or dry flat surface. 2. Place half a sheet of nori on the mat, rough side up, one edge of the nori lining-up with the front edge of the mat. 3. Dip your right fingers into the vinegar water. With damp fingers, take sushi rice and spread evenly over 2/3 of the nori, leaving a space at the back edge. With your right index finger, draw a line of wasabi along the rice. 4. Place strips of cucumber side by side along the wasabi line in the middle of the rice. 5. Using both hands, lift the front edge of the mat and roll up to the end of the rice. While still wrapped, gently shape the roll, pushing rice in at both ends with finger tips. 6. Keep lifting up front edge of the bamboo mat as you roll the sushi on to the remaining uncovered portion of nori, giving a final light press on the edge before removing the mat completely. 7. With a wet knife, slice the roll in half, then into thirds. 8. Serve with pickled ginger garnish and a dipping dish of soy sauce. • For your first few attempts at making sushi rolls, it is a good idea to keep fillings to a minimum to make rolling easier until you get the hang of it. • For more variety you can use other fillings like cooked carrot sticks, asparagus, avocado, tamago-yaki, and tuna. I like how we're going to use a Lebanese cucumber to make sushi. Global village rocks. p.s. I agree about not putting too much filling into the sushi the first few times you try to make it. Thanks angrygaijin, Lebanese cucumber are the best kind for sushi rolls and are pretty much available everywhere. Nice to live in a Global World. Hosomaki needs a lot of rolling and practice to make the rolls look good.